Centennial Woods is a 65-acre plot of land owned by the University of Vermont it was obtained from many individual landowners. There have been and still are many human uses on the land. Today when wandering through the woods there are clean trails, telephone poles, and leftover trash all signs of human use. But the use of this land goes back to the late 1800s to the early 1900s. During this time the land was used for farming and logging. In that time period, the Vermont economy was fueled by agriculture and logging. A photo from Burlington geography in 1937 shows this. 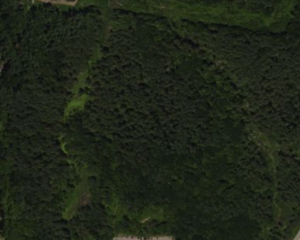 A large area of Centennial woods is missing compared to the images today. 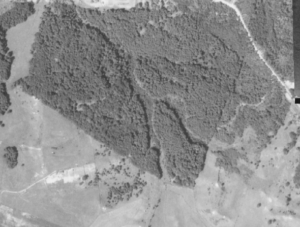 Also, many of the hardwoods that live in this forest are the same size, showing that they began growing at the same time. Many Vermont students use Centennial woods for labs, research projects, and as an area to relax in. The city of Burlington dumps snow in this area during the winter months. During my last trip to the woods, I saw a lone doe just hanging out 75 yards away from me. The doe did not run away from as I walked by. The deer non-existent reaction to me shows that wild animals are used to seeing human traffic. This entry was posted on Wednesday, December 5th, 2018 at 5:33 pm and is filed under Uncategorized. You can follow any responses to this entry through the RSS 2.0 feed. Responses are currently closed, but you can trackback from your own site.